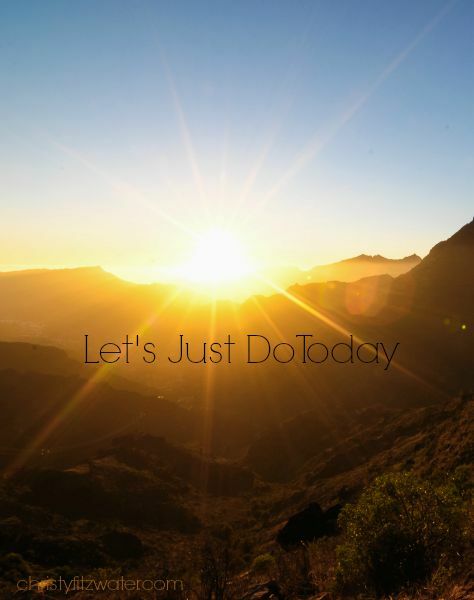 Let's Just Do Today, Shall We? Lots of emotions going in my neck of the woods. Everything from a wonderful stress over the surprise that I got a new, huge classroom at school (what to do with all those bulletin boards calling for my creativity) –to a small bout of depression over not being able to button my favorite skirt (I wonder what happened to shrink that skirt this summer?) –to an undisguised loathing of the calendar that is moving toward that day we’ll take Caleb to college (#notgonnacry). Can you put hashtags in a blog post? I feel a little avant-garde trying that. Anyway, I was maybe a combination of teary and hyperventilating last night. Matt had just gotten back from a run. “I wish you smelled better,” I said. “So you could hold me,” I said. So anyway, this morning I’m refreshed and awake. My son is still leaving for college soon. Skirt still doesn’t fit, I assume. And I haven’t even bought fabric for those bulletin boards, let alone create what I want to hang on them. But I have today, and what can I do with it? Today I can sketch a plan of what I want to put on one of the bulletin boards. And you, my friend? What life-changing habits, projects, and looming calendar dates are overwhelming? Are you doing like I was and trying to worry about it all at once? How much of this do you want me to focus on today? Thank you for this powerful simple encouragement. Right where I am. I, too, have a kiddo leaving for college in 11 days and my mind won’t shut the spin cycle down. Those pesky bouts of tears keep popping up unannounced too, but its a beautiful mess when I can remember just focus on today, not the next 11. Thanks for this gift today. Isn’t it painful? Definitely a grieving process that we can’t skirt around. I feel your pain! It does help to just determine to enjoy the day we’re in, though. So needed to hear this today. One thing at a time and just enough light for the step we’re on. I really needed to read that today. No kiddos leaving home here, however my oldest turned 16 last week and is about to start a dual High School program for his Jr and Sr years at a local college… Full time…. Taking a city bus…. To college…. Oh my. My other son is about to turn 13 and is heading to middle school. Crazy. We’ve had a hard year with a lot of other changes and heart breaking losses. So seeing my babies getting older feels so strange and sad. I’ve found myself feeling overwhelmed and sad thinking about “tomorrow”. But today is enough. I need to shift my focus to today. Enjoy today. Hug them today. Do what I can today. Your blog has been so inspirational to me. I truly look forward to your post and am thankful for them. Bless you for being so honest and letting others in your world. Oh, I do know what it’s like to have heartbreak and big life changes all happen at once. I feel for you! And I think our kids getting older is a constant pain for us as moms. Thanks for writing to me. I pray God continues to encourage you through this season. Oh yeah -we’re totally going to need that Kleenex!